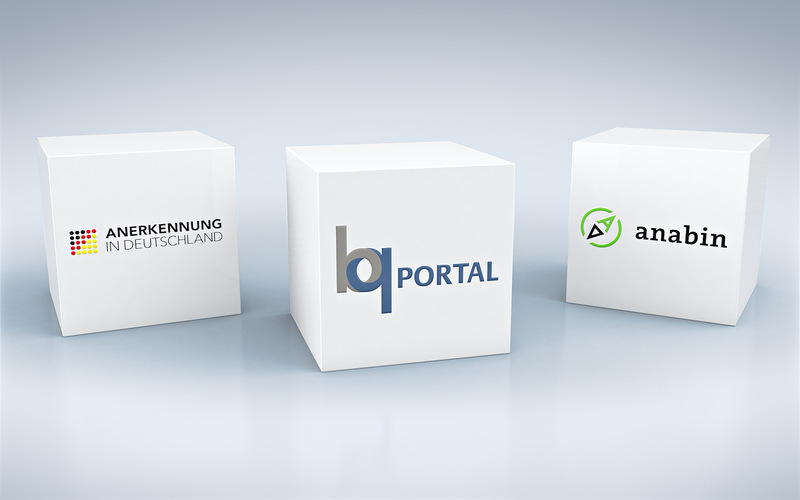 The BQ-Portal, the portal “Recognition in Germany” and the database “anabin” are the three central information portals for recognition of foreign professional qualifications. Since the Recognition Acts entered in force, the state government and the federal states established an extensive range of information structures aimed to support their implementation. The three information portals for recognition of foreign professional qualifications, “BQ-Portal”, “Recognition in Germany” and “anabin”, are central in this context. Their close cooperation ensures high quality content and consistency. A summary will show you precisely where to obtain information and assistance on the different stages of the procedure. The BQ-Portal offers a comprehensive online work and knowledge sharing platform, which helps the assessment authorities and companies to better assess and evaluate vocational and further training qualifications obtained abroad. On the portal “Recognition in Germany” the holders of foreign qualifications can find out, if their qualifications need to be officially recognized in order to practice their profession in Germany. The database “anabin” provides information to evaluate foreign qualifications and assists public authorities, employers, employees as well as private persons in classifying a foreign qualification within the German education system. The portal "Make it in Germany" provides the skilled workers with all the important information about working and living in Germany in German and in English, thereby contributing to a welcoming culture in Germany. The project "Unternehmen Berufsanerkennung" of the DIHK and ZDH informs companies about the advantages and benefits of formal recognition of foreign credentials. Therefore 11 chambers of commerce and industry and 5 chambers of crafts working together to promote the recognition within the companies.